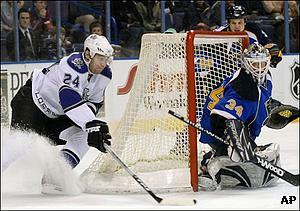 ST. LOUIS (AP) - It appeared to be a simple play. 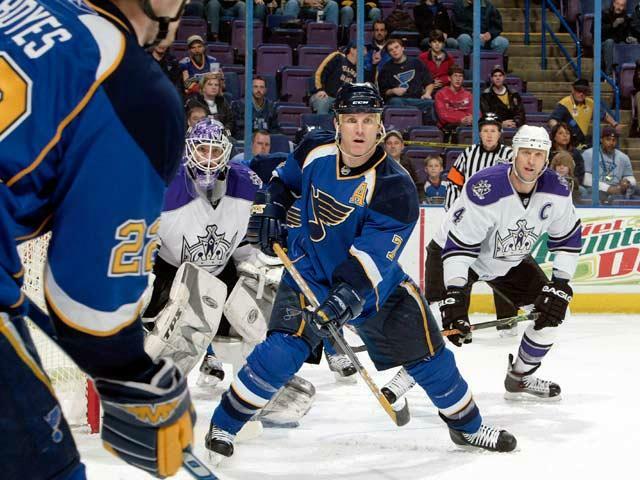 Mayers received an outlet pass from defenseman Jay McKee at center ice, tipped the puck to Johnson, who was able to race in along the right side and score the only goal of the third period as the Blues rallied to beat the Kings 3-2 on Tuesday night. McDonald quickly gave the Blues a 1-0 lead when he banged home a centering feed from Paul Kariya just 1:40 into the game, McDonald's 13th of the season. "We limit a team to two goals and we've done that in 11 of the last 13 games," Murray said. "It's amazing that our win totals have not been better than that, but tonight, we managed to score three goals." Notes: A heavy snowstorm kept many of the announced crowd of 14,973 away from Scottrade Center. There were roughly half as many fans in attendance. The St. Louis metropolitan area got anywhere from 8 to 12 inches of snow throughout the day Tuesday. ... 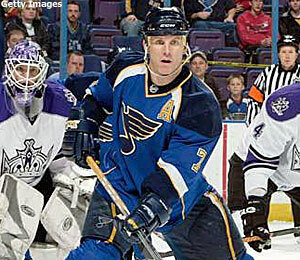 The Blues will hit the road for a nine-game road trip that begins Wednesday in Detroit. The trip will also take them to Vancouver, Calgary, Edmonton, San Jose, Anaheim, Montreal, Ottawa and Chicago.